Wondershare TunesGo phone manager offers you the ability to bypass the iTunes limitation of being able to connect only with Apple devices. This software works for both Android and iOS devices and can be installed too on both Mac and Windows operating systems. TunesGo is definitely not a replacement of iTunes because it does not offer any of the official Apple services but it does help you in adding to the features that iTunes already offers. With this you can easily manage your multimedia and other content and keep both your computer and your smartphone in sync. 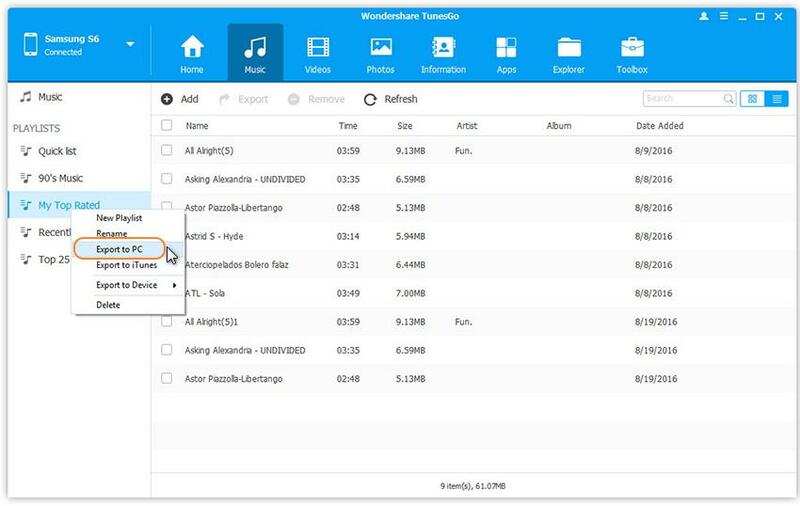 With Wondershare TunesGo not only you can copy your content from your smartphone to your computer and vice versa, but you can also do format conversion so that any of your multimedia files that are not supported on one of the platform can easily be converted to a supported format without you needing some additional software to do this intermediate task. Wondershare TunesGo is an intermediary between devices using varied operating systems. You can transfer files between your iOS and Windows machine, between Android and Mac, between iPhone and Android and whatever combination you can think of. TunesGo is there just to make your life simple of keeping your devices is sync. 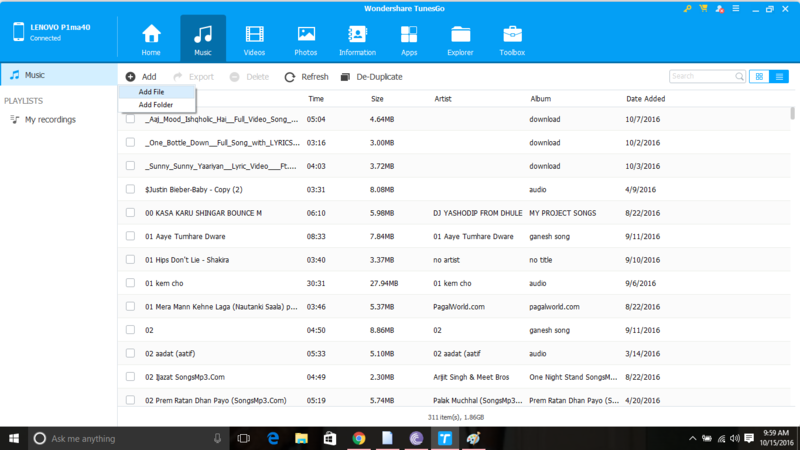 You can even completely stop using iTunes if you want but if you are a fan of iTunes functionality then Wondershare TunesGo can seamlessly sync up with that too and offer the the same functionalities and more! 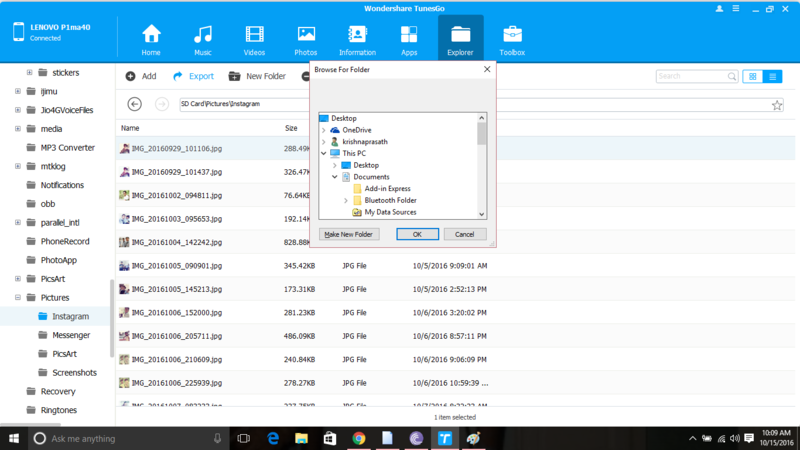 The first impression you get of Wondershare TunesGo is its elegant first screen. The design is metro interface with some tasteful artistry. Most of the features of the tool can be accessed directly from the main screen. There is clear labeling, no excessive cluttering, all in all a simplistic and non-confusing interface. An extra feature you get with TunesGo is the ability to download media files from a plethora of websites like YouTune, Vimeo, SoundCloud, MTV etc. You can even download a complete playlist from http://www.tunesgo.com/. The data you store to your computer can be stored at any location of your choice, be it in a folder on your computer or an external hard drive. Just go to the file you want to transfer, click and select the target location. Just the way you would want it to be. The process is so short and simple that it actually feels humanely normal like picking and dropping it. You can even backup your SMS and contacts from the smartphone to your computer or from your computer Outlook to your iPhone/Android smartphone. Yes, you read it right. TunesGo can even help you in rooting your Android smartphone. It makes the process much simpler and safer than doing it manually by yourself. There is an option labeled 1-Click-Root which takes care of all the process of rooting. 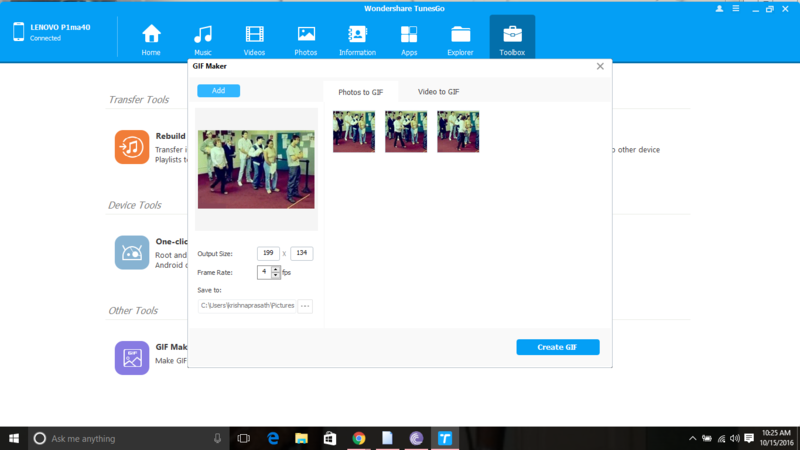 TunesGo from Wondershare allows you to make beautiful memories from your images or videos. Just select the images or video and make a .gif file from it. You can edit the images too before making the gif from within the software itself. You can even Add, Delete, Edit or Merge your smartphone contacts from your computer using TunesGo. You can access all your smartphone data from the TunesGo interface in a modern looking File Explorer. Copy the whole data, open any file or delete it, you can do anything you want to the files just like they are actually present on your computer and not on your smartphone. You can ave your mobile data by using TunesGo itself for downloading and installing apps from the respective market places. You can see the details of the apps that are installed and even uninstall it directly from the UI of TunesGo. Play your music in a portal media player by burning your playlist directly to a CD using the CD burning tool presently in TunesGo software itself. If you are listening to some live music through a broadcast then you don't need to use some other software like Audicity to be able to record it. Just can do that right from TunesGo itself. 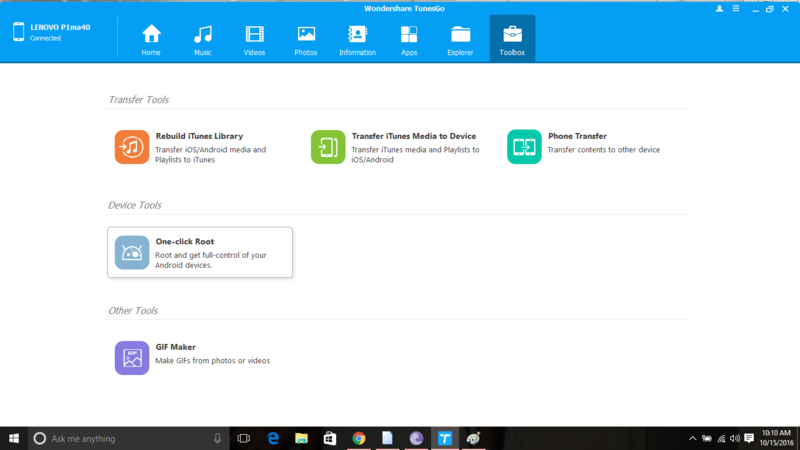 TunesGo from Wondershare is definitely a power packed tool instead of just a software for file transfer. It can be used instead of iTunes or as a complimentary software. It is like a pack of softwares packed into one but without adding to any of the complexity. Even an average user would have to agree that there is some or the other feature that they would find useful in this software. With so many features to boast about, I don't feel that a $59.95 price tag for lifetime is too costly for this beauty.